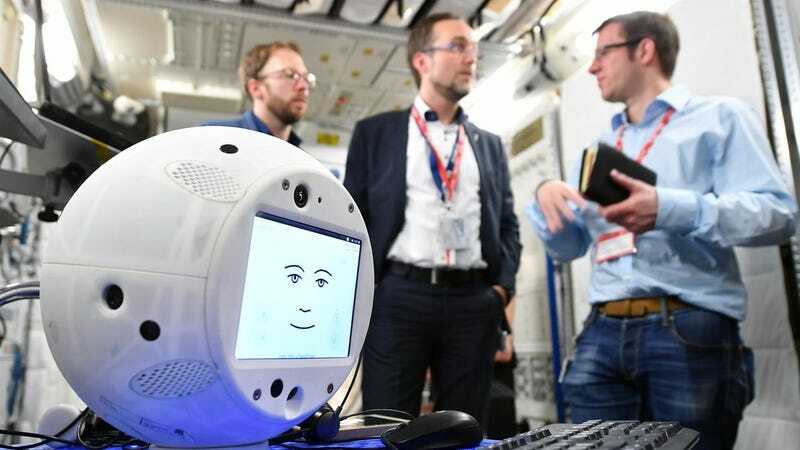 Introducing CIMON, a floating, basketball-sized robot that will serve as a companion and assistant to crew members aboard the International Space Station. Infused with artificial intelligence, the floating bot is reminiscent of HAL from 2001: A Space Odyssey, but far less evil. We hope. Earlier today, SpaceX successfully launched a recycled Falcon 9 rocket from Cape Canaveral, Florida carrying around 6,000 pounds of cargo to the ISS. In addition to delivering genetically identical mice, super-caffeinated coffee, and other supplies, the CRS-15 Dragon capsule contains CIMON, the first interactive flight companion to take part in an ISS mission. Once aboard, CIMON—short for Crew Interactive MObile companioN—will assist the crew with its many activities. The point of this pilot project is to see if an artificially intelligent bot can improve crew efficiency and morale during longer missions, including a possible mission to Mars. What’s more, activities and tasks performed by ISS crew members are starting to get more complicated, so an AI could help. CIMON doesn’t have any arms or legs, so it can’t assist with any physical tasks, but it features a language user interface, allowing crew members to verbally communicate with it. The bot can display repair instructions on its screen, and even search for objects in the ISS. With a reduced workload, astronauts will hopefully experience less stress and have more time to relax. CIMON was built by Airbus under a contract awarded by the German Aerospace Centre (DLR). It has 12 internal fans, which allows the bot to move in all directions as it floats in microgravity. CIMON can move freely, and perform rotational movements such as shaking its head back-and-forth in disapproval. CIMON’s AI language and comprehension system is derived from IBM’s Watson Technology, and it responds to commands in English. CIMON cost less than £5 million to build, and less than two years to develop. The pilot project will be led by DLR astronaut Alexander Gerst, who arrived on the ISS about a month ago. CIMON is already familiar with Gerst’s face and voice, so the bot will work best with him, at least initially. The German astronaut will use CIMON to see if the bot will increase his efficiency and effectiveness as he works on various experiments. Indeed, with CIMON floating nearby, the ISS astronauts could easily call upon the bot for assistance, which they can do by calling out its name. They can request that CIMON display documents and media in their field of view, or record and playback experiments with its onboard camera. In general, the bot should speed up tasks on the ISS that require hands-on work. The round robot features no sharp edges, so it poses no threat to equipment or crew. Should it start to go squirrelly and use its best HAL-9000 imitation to say something like, “I’m sorry, Alexander, I’m afraid I can’t do that,” the bot is equipped with a kill switch. But hopefully it won’t come to that; unlike HAL, CIMON has been programmed with an ISTJ personality, meaning “introverted, sensing, thinking, and judging.” Its developers chose a face to make it more personable and relatable, and it can even sense the tone of the crew’s conversation. CIMON smiles when the mood is upbeat, and frowns or cries when things are sad. It supposedly behaves like R2D2, and can even quote famous sci-fi movies like E.T. the Extra-Terrestrial. CIMON has an open invitation to stay aboard the ISS, and it will likely improve over the duration of its stay, receiving software updates via IBM’s Cloud.